A young officer (Russell Wade) on a freighter begins to suspect that his captain (Richard Dix) is a megalomaniac psychopath — but no one else on board believes him, and soon he finds that his own life is at risk. This recently rediscovered RKO horror film — directed by Mark Robson — remains one of B-producer Val Lewton’s least heralded yet most enjoyable thrillers. Taking place largely on board a freighter (a setting which effectively heightens the sense of claustrophobia felt by Wade, the film’s protagonist), The Ghost Ship features an unusual variation on the theme of power-mad leaders who must be stopped before they spiral out of control. 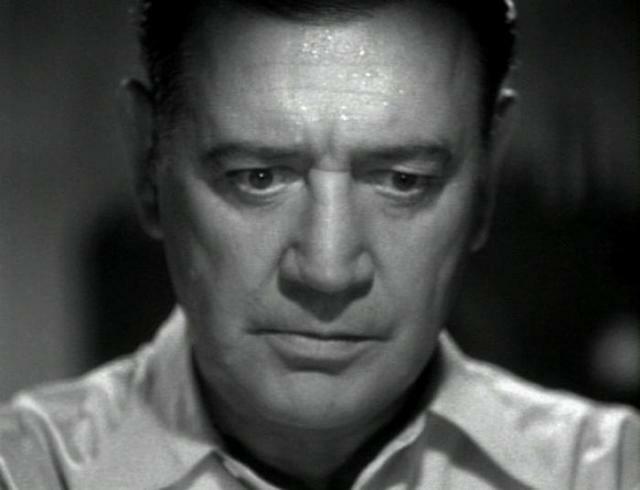 In this case, Captain Stone — nicely played by former matinee idol Richard Dix, of Cimarron (1931) fame — has developed a cult of personality which prevents most of his crew members from questioning his authority; indeed, even Wade is initially swayed by Stone’s warped reasoning that being responsible for his men’s lives also gives him the power to take those lives from them. 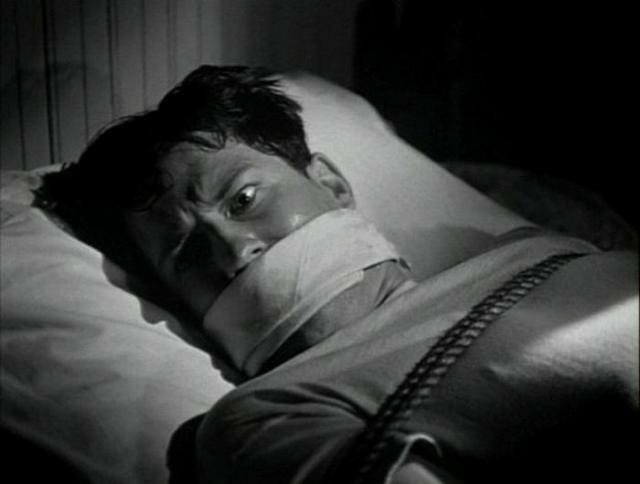 Scene after powerful scene — Stone being too frightened to perform an appendectomy on an ailing sailor (Paul Marion), yet justifying his fear as reasonable afterwards; a sailor (Lawrence Tierney) being “accidentally” crushed to death by a heavy chain after daring to stand up to Stone — leave audience members frightened yet genuinely confused about what to believe, particularly after watching a later scene in which Dix confesses (to a sympathetic female friend, played by Edith Barrett) his own fears about slowly going mad. 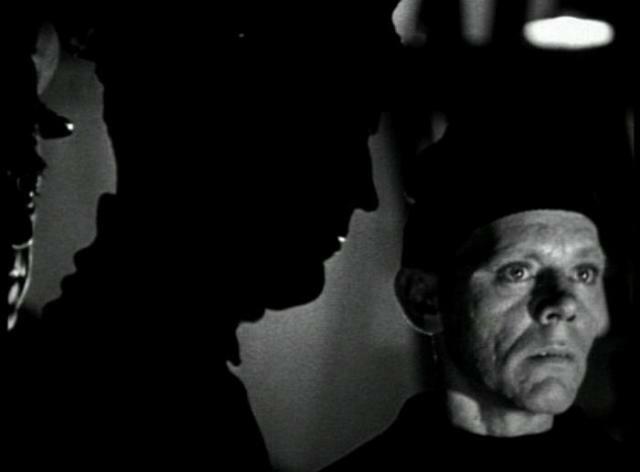 In addition to its tightly scripted screenplay (by Donald Henderson Clarke, based on a story by Leo Mittler), The Ghost Ship is full of Lewton’s characteristic visual and literate sensibility. Nicholas Musuraca’s atmospheric black-and-white cinematography neatly evokes a noirish world on board the ship, while the casting of Skelton Knaggs as Finn the Mute — an omniscient voice-over narrator who plays an unexpectedly important role near the end of the film — serves as an inspired homage to the “chorus” of classical theater. As with all of Lewton’s other RKO “horror” films, The Ghost Ship‘s title is actually a bit of a misnomer, given that no ghosts ever appear — but Lewton’s unique gift lay in creating highly memorable, low-budget thrillers which relied more on the power of psychology than on overt chills, and this film is no exception. Film fanatics should definitely check it out. Yes, as one of Lewton’s most effective thrillers. In total agreement here – very much a must. 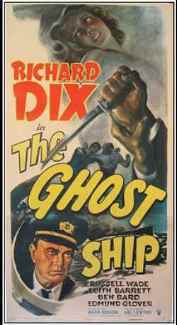 One would think that, at a mere 69 min., ‘Ghost Ship’ would open like gangbusters story-wise and leap along. Instead, it creeps up on you. With its leisurely pace, you start wondering where – or whether – it’s going. Then it starts to get you. As stated, the title is something of a misnomer – and yet it isn’t. At any rate, almost the entire picture has been filmed in a ghostly manner. And as the story develops, so – for the viewers – do the jitters. The last 20+ min. in particular are downright creepy, even if not in standard horror form. Dix gives a masterful, layered performance here (esp. when thrown into self-doubt), and is ably supported – esp. by Wade and Edmund Glover as Sparks (with his contradictory manner of, first, warning Wade as a friend, then not taking Wade’s side when that’s needed). Another very unique little gem from Lewton (tho technically directed by Robson). NOTE: See imdb.com for some insight – if not a completely satisfying explanation – re: why this film was suppressed for so long.